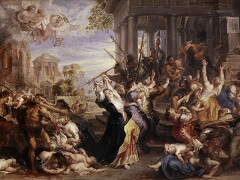 This work was described in 1630 as one executed by Rubens 'in honour of England', which he sent home to Flanders as a 'monument to his abode & employment here' (Rubens stayed in England as a diplomat from 1629-1630). 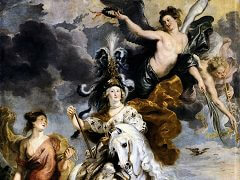 The painting was later 'bought back' for Charles I by his ambassador to the Spanish Netherlands, Endymion Porter, probably in 1634-5. Roger de Piles was the first to suggest (in 1677) that the setting and characters here are specifically English; since then it has been generally agreed that the river is roughly-speaking the Thames (perhaps showing the view from York House where Rubens lodged in London) and that St George is a portrait of (or at an allusion to) Charles I. The Princess does not look anything like his Queen Henrietta Maria as has also been suggested. 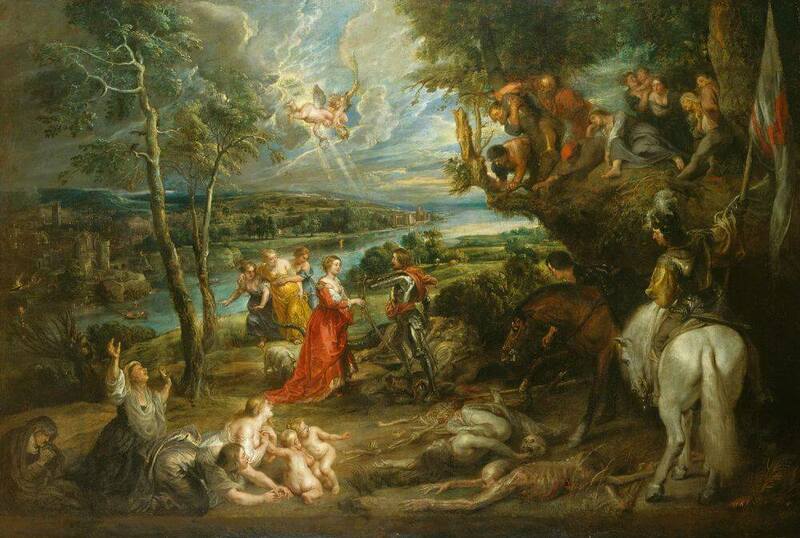 As with almost all Rubens's landscapes this one grew in the making; the many joins in the canvas are visible to the naked eye. The original composition sits in the left middle of the final one, its left edge just including the tower, its right edge just two complete tree-climbers, its top edge just two angels and its bottom edge just the base of the truck of the left-hand tree. This is clearly a satisfactory composition in its own right and is very beautifully and delicately painted. 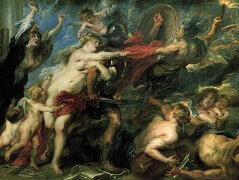 Rubens stitched a further eight rectangles of canvas to this basic 'core', the purpose of which seems to have been to add two new episodes: the mounted standard bearer to the right and the 'Birth-Death' contrast across the bottom. This in turn required strips to be added to the left and top to prevent the whole from becoming lop-sided and further mini-episodes to be created to fill corners. 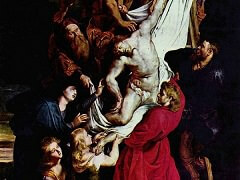 These additions are almost certainly by Rubens but executed more rapidly than the centre and with a thinner application of paint. 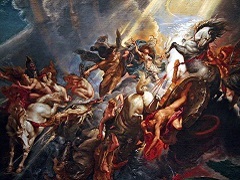 If the middle bit was painted as Rubens left London the outsides could have been added in Flanders when Porter acquired the work for Charles I (perhaps to make it grander and more royal). 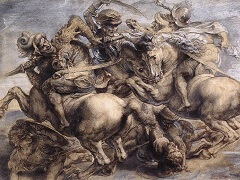 However the whole process is typical of Rubens's 'expanding' landscapes (of which there are many examples) and corresponds to the way in which he (and indeed any artist) works on a sketch: beginning carefully in the centre and becoming more summary towards the margins. 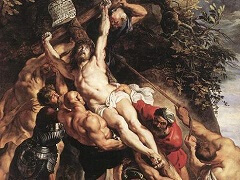 The unusual thing about Rubens was that his sketches were generally executed in oil paint on panel (as opposed to chalk on paper) and that he preserved the fresh 'evolving' character of a sketch in his finished paintings.